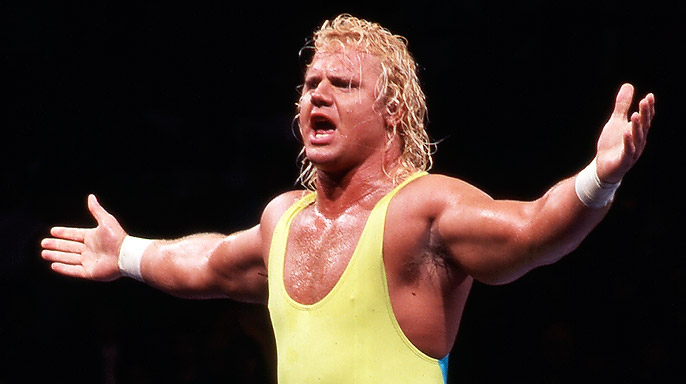 Check out Curt Hennig’s WWE Alumni profile here! Parents: Larry and Irene Hennig | Brothers and Sisters: Randy, Sandra, Susan, Jesse. March 28, 1958: Curt Hennig was born in and grew up in Robbinsdale, Minnesota, a suburb of Minneapolis. Curt Hennig attended Robbinsdale High School in Minnesota. ~~~Graduated the same year as Brady Boone, Tom Zenk and Rick Rude, and shortly before John Nord, Nikita Koloff and Barry Darsow. Curt Hennig was great friends with Rick Rude and remained friends during their wrestling careers. Curt Hennig played football at the University of Minnesota, where he injured his knee, and ended up rehabbing with Verne Gagne. 1979: Curt Hennig began his career competing primarily in Wisconsin, Colorado, and Western Canada. 1981: Curt Hennig had a short stint with the World Wrestling Federationas a jobber to the stars. Curt Hennig worked extentensively for an organization called NWA-Pacific Northwest run by Don Owens. Curt Hennig formed a tag team with his father, Larry “the Axe” Hennig, and they were known as “The Axe Attack”. April 27, 1982: Curt Hennig captured the Pacific Northwest Tag Team titles with Larry Hennig from Rip Oliver and Matt Borne. May 10, 1983: Curt Hennig defeated Sheik Abdullah Ali Hassen for the Pacific Coast title in Portland, Oregon. November 5, 1983: Curt Hennig captured the Pacific Northwest Tag Team titles with Buddy Rose from Rip Oliver and The Assassin. December 23, 1983: Curt Hennig captured the Pacific Northwest Tag Team titles with Pat McGhee from Dynamite Kidand The Assassin. 1984: Curt Hennig signed with Verne Gagne’s American Wrestling Association in Minnesota. May 21, 1985 – Pacific Northwest 60th Anniversary: Curt and Larry Hennig defeated the Road Warriors (AWA Tag Champs) via DQ. September 28, 1985 – SuperClash: Curt Hennig and Scott Hall and Greg Gagne defeated Ray Stevens and Nick Bockwinkel and Larry Zbysko. December 12, 1985: Curt Hennig and Nick Bockwinkel defeated Isamu Teranishi and Masanobu Kurisu in Tokyo, Japan. January 18, 1986: Curt Hennig and Scott Hall defeated Steve Regal and Jim Garvin for the AWA World Tag Team titles. April 20, 1986 – WrestleRock: Curt Hennig and Scott Hall defeated Bill and Scott Irwin to retain the AWA World Tag Team titles. April 28, 1986 – AWA/NWA Rage in a Cage: Scott Hall and Curt Hennig defeated Konga the Barbarian and Boris Zuhkov to retain. June 28, 1986 – AWA Battle by the Bay: The Midnight Rockers and Curt Hennig defeated Buddy Rose and Doug Somers and Alexis Smirnoff. December 25, 1986 – AWA Brawl in St. Paul: Nick Bockwinkel defeated Curt Hennig by Disqualification to retain the title. May 2, 1987 – AWA SuperClash II: Curt Hennig defeated Nick Bockwinkel for the AWA World Title with help from Larry Zbyszko. ~~~The title was held up and upon review but was awarded to Curt Hennig eleven days later. April 16, 1988 – AWA Rage in a Cage II: Wahoo McDaniel defeated Curt Hennig in a “Steel Cage” match. May of 1988: Jerry “The King” Lawler defeated Curt Hennig for the AWA World Heavyweight title. 1988: Curt Hennig arrived in the World Wrestling Federation and was sattled with the “Mr. Perfect” gimmick. July 31, 1988 – Wrestlefest: Curt Hennig (not yet billed as Mr Perfect) defeated Terry Taylor. November 24, 1988 – Survivor Series: Mr Perfect competed on Andre The Giant‘s team going up against Jim Duggan‘s team. January 7, 1989 – Saturday Night’s Main Event: Mr Perfect defeated Koko B. Ware. April 2, 1989 – Wrestlemania V: Mr Perfect defeated the Blue Blazer (Owen Hart). August 28, 1989 – Summerslam: Mr Perfect defeated the Red Rooster. November 23, 1989 – Survivor Series: Mr Perfect is the sole survivor in his match against Roddy Piper’s team. November 25, 1989 – Saturday Night’s Main Event: Mr. Perfect defeated Red Rooster. April 1, 1990 – Wrestlemania VI: Brutus Beefcake over Mr. Perfect. April 23, 1990: Mr. Perfect defeated Tito Santana at the end of a Battle Royal to capture the vacant Intercontinental title. Mr Perfect announced Bobby “the Brain” Heenan as his ‘perfect’ Manager. April 28, 1990 – Saturday Night’s Main Event: Hulk Hogan defeated Mr. Perfect. July 28, 1990 – Saturday Night’s Main Event: Mr Perfect defeated Tito Santana to retain the Intercontinental Title. August 27, 1990 – Summerslam: The Texas Tornado (Kerry von Erich) defeated Mr Perfect to win the Intercontinental Title. October 30, 1990 – The Main Event: Mr. Perfect defeated The Big Bossman by Countout. November 19, 1990: Mr. Perfect captured his second Intercontinental title from “the Texas Tornado” Kerry Von Erich. November 22, 1990 – Survivor Series: Mr Perfect teamed with Demolition vs Ultimate Warrior and Kerry von Erich and Legion of Doom. March 24, 1991 – Wrestlemania VII: Big Bossman defeated Mr Perfect by DQ – Perfect retains IC title. April 27, 1991 – Saturday Night’s Main Event: Mr Perfect wins a big Battle Royal. Mr Perfect suffered a back injury while wrestling in the ring, but Vince McMahon asked to wrestle one more match and drop the title. August 26, 1991 – Summerslam: Bret Hart defeated Mr Perfect to win the IC title in a classic wrestling match. 1992: Mr Perfect served both as Ric Flair’s executive consultant and as a WWF commentator. August 29, 1992 – Summerslam: Mr Perfect and Ric Flair interfered constantly in a match between Ultimate Warrior vs Randy Savage. September 1, 1992: Mr. Perfect interfered in a WWF title match that assisted Ric Flair in winning the WWF title. Mr. Perfect eventually broke loose from Ric Flair’s entourage and feuded with the Nature Boy. November 24, 1992 – Survivor Series: Randy Savage and Mr. Perfect defeated Ric Flair and Razor Ramon by DQ. January 18, 1993 – RAW: Mr. Perfect defeated “Terrific” Terry Taylor. ~~~During the match, Ric Flair tried to distract Mr. Perfect but it backfired. January 24, 1993 – Royal Rumble: Mr. Perfect eliminated Ric Flair from the Royal Rumble match. January 25, 1993 – RAW: Mr. Perfect defeated “Nature Boy” Ric Flair in a loser-leaves-the-WWF match. April 4, 1993 – Wrestlemania IX: Lex Luger defeated Mr. Perfect. April, 11, 1993 – UK Rampage: Mr. Perfect defeated Samu. April 26, 1993 – RAW: Mr. Perfect b Damian Demento. May 10, 1993 – RAW: Mr. Perfect defeated Iron Mike Sharpe. May 24, 1993 – RAW: Mr. Perfect defeated Doink the clown. June 13, 1993 – King of the Ring: Bret Hart defeated Mr Perfect in the 2nd round in yet another classic wrestling match. June 14, 1993 – RAW: Mr. Perfect defeated L.A. Gore. July 5, 1993 – RAW: Mr. Perfect defeated Brian Costello. August 2, 1993 – RAW: Mr. Perfect defeated Rich Myers. August 30, 1993 – Summerslam: Shawn Michaels defeated Mr Perfect by COUNT OUT to retain the IC title. October 4, 1993 – RAW: Mr. Perfect competed in a battle royal for the WWF Intercontinental Title. November 1, 1993 – RAW: Mr. Perfect defeated The Executioner. Late 1993: Hennig seriously injured his back and he received compensation from Lloyds of London insurance company. March 20, 1994 – Wrestlemania X: Mr. Perfect refereed a match between Lex Luger vs Yokozuna, DQ’ing Luger in the process. Mr Perfect returned to the World Wrestling Federation in a managerial roll, seeking out the “Perfect” protege. Mr Perfect began training for his in-ring-comback in the World Wrestling Federation. September 30, 1996 – RAW: Hunter Hearst-Helmsley issued a challenge to Mr. Perfect. October 14, 1996 – RAW: Freddie Joe Floyd (Tracy Smothers) defeated Hunter Hearst Helmsley by Countout. ~~~Mr. Perfect came down and stole Helmsley’s beautiful valet and HHH lost focus and ran backstage. October 21, 1996 – RAW: Hunter Hearst Helmsley vs Mr. Perfect. ~~~Triple H attacked Mr. Perfect backstage, and Perfect wasn’t medically cleared to wrestle. ~~~Marc Mero voluteered to go in his place. HHH beat Marc Mero w/Sable to win the Intercontinental title! ~~~The match ended when Mr. Perfect turned on Marc Mero and formed an alliance with Hunter Hearst Helmsley! Mr Perfect has a contract dispute with the WWF and suddenly leaves for World Championship Wrestling. July 1997: Curt Hennig appeared on the scene as a hot “prospect” trying to be recruited by both the Four Horsemen and the nWo. August 4, 1997 – Nitro: Curt Hennig defeated Mortis (Chris Kanyon). August 9, 1997 – Road Wild: Curt Hennig defeated Diamond Dallas Page. August 11, 1997 – Nitro: Curt Hennig defeated Randy “Macho Man” Savage by DQ. August 18, 1997 – Nitro: Curt Hennig defeated The Giant by Count Out. August 21, 1997 – Clash of the Champions XXXV: Curt Hennig and Ric Flair defeated Syxx and Konnan. August 25, 1997: Arn Anderson retired from the Horsemen and offered his spot to Curt Hennig. ~~~Curt Hennig proudly replied, “It would be a honor”. September 8, 1997 – Nitro: Ric Flair and Curt Hennig defeated Konnan and Buff Bagwell. September 12, 1997 – Fall Brawl: Curt Hennig turned on the Horsemen and joined the nWo during the War Games match. September 14, 1997 – Fall Brawl: The nWo (Kevin Nash and Syxx-Pac and Buff Bagwell and Konnan) defeated The IV Horsemen (Ric Flair and Chris Benoit and Steve McMichael and Curt Hennig). Curt Hennig turned on the 4 Horsemen and joined the nWo. September 15, 1997 – Nitro: Curt Hennig defeated Steve McMichael to win the WCW United States Title. September 22, 1997 – Nitro: WCW United States champion Curt Hennig defeated Jeff Jarrett. September 29, 1997 – Nitro: The Giant defeated WCW United States champion Curt Hennig by DQ. October 6, 1997 – Nitro: WCW United States champion Curt Hennig defeated Chris Benoit. October 13, 1997 – Nitro: WCW United States champion Curt Hennig defeated Diamond Dallas Page by DQ. October 20, 1997 – Nitro: WCW United States champion Curt Hennig defeated Dean Malenko. October 26, 1997 – Halloween Havoc: Curt Hennig defeated Ric Flair by DQ to retain the WCW United States Title. October 27, 1997 – Nitro: WCW United States champion Curt Hennig defeated Booker T by DQ. November 3, 1997 – Nitro: WCW United States champion Curt Hennig defeated Lex Luger by DQ. November 10, 1997 – Nitro: Diamond Dallas Page defeated Curt Hennig by DQ. November 17, 1997 – Nitro: Lex Luger defeated Curt Hennig by DQ. November 23, 1997 – World War III: Curt Hennig defeated Ric Flair by pinfall to retain the WCW United States Title. November 24, 1997 – Nitro: Ray Traylor defeated WCW United States champion Curt Hennig by DQ. December 1, 1997 – Nitro: Diamond Dallas Page defeated WCW United States champion Curt Hennig by DQ. December 15, 1997 – Nitro: Ric Flair defeated WCW United States champion Curt Hennig by DQ. December 22, 1997 – Nitro: WCW United States champion Curt Hennig defeated World Television Champion Disco Inferno. December 28, 1997 – Starrcade: Diamond Dallas Page defeated Curt Hennig to win the WCW United States Title. December 29, 1997 – Nitro: Curt Hennig defeated Chris Jericho. February 16, 1998 – Nitro: Curt Hennig defeated Bobby Eaton. March 2, 1998 – Nitro: Ric Flair vs. Curt Hennig ended in a No Contest. March 9, 1998 – Nitro: Ric Flair defeated Curt Hennig by DQ. March 15, 1998 – Uncensored: Bret Hart defeated Curt Hennig, After the match: “Ravishing” Rick Rude attacked Bret Hart along with Curt Hennig. March 23, 1998 – Nitro: Davey Boy Smith defeated Curt Hennig by DQ. March 30, 1998 – Nitro: Jim Neidhart defeated Curt Hennig by DQ. April 13, 1998 – Nitro: Curt Hennig defeated Yuji Nagata. April 19, 1998 – Spring Stampede: Curt Hennig defeated Davey Boy Smith. April 20, 1998 – Nitro: Chris Benoit defeated Curt Hennig by DQ. July 13, 1998 – Nitro: World Heavyweight Champion Bill Goldberg defeated Curt Hennig. July 20, 1998 – Nitro: Curt Hennig defeated Lex Luger. July 27, 1998 – Nitro: Curt Hennig defeated Steve McMichael. August 3, 1998 – Nitro: Curt Hennig defeated Konnan. August 8, 1998 – Road Wild: Curt Hennig was in the battle royal won by Bill Goldberg. August 10, 1998 – Nitro: Curt Hennig defeated Konnan by DQ. August 17, 1998 – Nitro: Curt Hennig defeated Dean Malenko. August 24, 1998 – Nitro: World Television Champion Chris Jericho defeated Curt Hennig by DQ. September 7, 1998 – Nitro: Dean Malenko defeated Curt Hennig in a steel cage match. September 13, 1998 – Fall Brawl: Dean Malenko defeated Curt Hennig by Disqualification. After the nWo dispanded, Curt Hennig formed a new faction called the West Texas Rednecks. ~~~The group, including Bobby Duncum Jr. and The Windham Brothers, recorded their own entrance theme, “Rap Is Crap”. January 11, 1999 – Nitro: Ric Flair defeated Curt Hennig. January 14, 1999 – Thunder: Steve McMichal and Chris Benoit defeated Barry Windham and Curt Hennig by DQ. January 17, 1999 – Souled Out: Ric Flair and David Flair defeated Barry Windham and Curt Hennig. February 4, 1999 – Thunder: Curt Hennig and Barry Windham defeated Mike Enos and Bobby Duncum Jr.
February 9, 1999 – Nitro: Curt Hennig and Barry Windham defeated Brian Adams and Horace Hogan. February 21, 1999 – Superbrawl: Curt Hennig and Barry Windham defeated Chris Benoit and Dean Malenko for the Tag Team titles. March 4, 1999 – Thunder: World Tag Team Champions Curt Hennig and Barry Windham defeated Horace Hogan and Vincent by DQ. April 28, 1999 – Thunder: Curt Hennig defeated World Television Champion Booker T by Count Out. May 17, 1999 – Nitro: Curt Hennig defeated Konnan. May 20, 1999 – Thunder: Curt Hennig vs. Disco Inferno ended in a No Contest. May 31, 1999 – Nitro: Rey Mysterio Jr. and Konnan defeated Curt Hennig and Bobby Duncum Jr.
June 3, 1999 – Thunder: World Cruiserweight Champion Rey Mysterio Jr. defeated Curt Hennig by DQ. June 13, 1999 – Great American Bash: Hennig requested Master P.’s autograph, but threw the CD down to enrage his entourage. ~~~Later that night, The Filthy Animals (Konnan and Rey Mysterio Jr.) defeated Curt Hennig and Bobby Duncum Jr.
June 17, 1999 – Thunder: Curt Hennig and Bobby Duncum Jr. defeated The Texas Hangmen. June 24, 1999 – Thunder: Curt Hennig defeated Lenny Lane. June 28, 1999 – Nitro: Curt Hennig and B. Windham and K. Windham and Bobby Duncum Jr. defeated Brian Adams and Vincent and Horace Hogan and Stevie Ray. July 1, 1999 – Thunder: Curt Hennig and Bobby Duncum Jr. and Barry Windham and Kendall Windham dfeated Damien and El Dandy and Silver King and Villano V.
July 11, 1999 – Bash at the Beach: No Limit Soldiers defeated West Texas Rednecks in an 8-man-tag-team-match. ~~~Konnan and Rey Mysterio and Brad Armstrong and Swoll beat Curt Hennig and Bobby Duncum Jr. and Barry and Kendall Windham. July 14, 1999 – Thunder: World Tag Team Champions Bam Bam Bigelow and Diamond Dallas Page and Kanyon vs. Curt Hennig and Barry Windham ended in a No Contest. July 19, 1999 – Nitro: Perry Saturn and Chris Benoit defeated Curt Hennig and Barry Windham. July 21, 1999 – Thunder: Curt Hennig defeated Chase Tatum. July 26, 1999 – Nitro: Bill Goldberg defeated Curt Hennig by DQ. August 2, 1999 – Nitro: Perry Saturn defeated Curt Hennig. August 9, 1999 – Nitro: Curt Hennig and Barry Windham defeated Public Enemy. October 4, 1999 – Nitro: Curt Hennig defeated Brad Armstrong. November 1, 1999 – Nitro: Curt Hennig defeated Disco Inferno by Count Out. November 8, 1999 – Nitro: Jeff Jarrett defeated Curt Hennig. November 15, 1999 – Nitro: Bill Goldberg defeated Curt Hennig. November 18, 1999 – Thunder: Curt Hennig defeated Van Hammer. November 21, 1999 – Mayhem: Buff Bagwell defeated Curt Hennig in a retirement match. November 29, 1999 – Nitro: Curt Hennig defeated Midnight. December 6, 1999 – Nitro: Curt Hennig defeated Larry Zbyszko. December 13, 1999 – Nitro: Roddy Piper defeated Curt Hennig by Count Out in a chair match. December 16, 1999 – Thunder: Curt Hennig vs. Dustin Rhodes ended in a No Contest, later that night Sid Vicious and Chris Benoit defeated Curt Hennig, La Parka, Shane and Creative Control by DQ. December 19, 1999 – Starrcade: Creative Control and Curt Henning defeated Harlem Heat and Midnight. December 20, 1999 – Nitro: Curt Hennig defeated Hugh Morris. December 23, 1999 – Thunder: The Harris Brothers defeated Curt Hennig in a handicap match. January 10, 2000 – Thunder: Curt Hennig vs. Jim Duggan ended in a No Contest. March 6, 2000 – Nitro: Curt Hennig defeated Ric Flair. March 13, 2000 – Nitro: Curt Hennig defeated Lex Luger by DQ, later that night Ric Flair and Lex Luger defeated Hulk Hogan and Curt Hennig by DQ. March 20, 2000 – Nitro: Curt Hennig defeated Dustin Rhodes by DQ. March 27, 2000 – Nitro: WCW United States champion Jeff Jarrett and Scott Steiner defeated Curt Hennig and Buff Bagwell. April 10, 2000 – Nitro: Jeff Jarrett defeated Curt Hennig. April 17, 2000 – Nitro: Stan Stasiak defeated Curt Hennig. May 7, 2000 – Slamboree: Shawn Stasiak defeated Curt Hennig (After this match; Curt began coaching Shawn). Summer 2000: Curt Hennig’s contract with World Championship Wrestling expired. July 28, 2000: Curt Hennig defeated Brutus Beefcake to become the first Superstars of Wrestling champion. Summer 2001: Curt Hennig was recognized as the first MEWF (Main Event Wrestling Federation) champion. 2001: Curt Hennig wrestled Dennis Rodman on an Independant show in Australia. Late 2001: Curt Hennig briefly appeared in the short-lived Jimmy Hart Xtreme Wrestling Federation promotion. Curt Hennig also made appearances in 3PW, IPW and Dusty Rhodes’s Turnbuckle Championship Wrestling. January 20, 2002 – Royal Rumble: Mr. Perfect entered the rumble at #25 and was eliminated by Triple H.
~~~This was officially a one night only contract, to participate in the annual Royal Rumble match. ~~~Mr. Perfect registered an impressive performance, being the third to last wrestler eliminated. ~~~WWF management was so impressed with Perfect that they are considering a more long term contract offer. Mr. Perfect did indeed sign with the WWF and appeared on Monday Night RAW the night after the Rumble. January 21, 2002 – RAW: Val Venis vs. Mr. Perfect ended in a No Contest (After the match; Stone Cold attacked Perfect and Venis). Mr Perfect got involved in an angle with Stone Cold Steve Austin, who smashed Perfect’s head in with another chairshot. February 2, 2002 – Jakked: Mr. Perfect defeated Brock Lesnar in a dark match. February 9-10, 2002 – House Show: Mr. Perfect defeated Brock Lesnar. February 11, 2002 – RAW: Mr. Perfect started bragging backstage saying he was Perfect after he won a chess match. February 25, 2002 – RAW: Stone Cold Steve Austin defeated Mr. Perfect (after the match the nWo attacked Stone Cold). March 3, 2002 – HEAT: Edge defeated Mr. Perfect. March 4, 2002 – RAW: Test and Mr. Perfect defeated Scotty Too Hotty and Albert (After the match; Rikishi attacked Test and Perfect). March 10, 2002 – HEAT: Mr. Perfect defeated Rikishi. March 11, 2002 – RAW: Test defeated Rikishi with the help from Mr. Perfect. March 17, 2002 – HEAT International: Mr. Perfect defeated The Godfather. March 17, 2002 – WrestleMania 18 (HEAT): Scotty Too Hotty, Albert and Rikishi beat Mr. Perfect, Lance Storm and Test. March 23, 2002 – Jakked: The APA (Bradshaw and Faarooq) defeated Mr. Perfect and The Big Bossman. March 24, 2002 – HEAT: Rob Van Dam defeated Mr. Perfect to retain the WWE Intercontinental title. March 25, 2002 – RAW: Tazz defeated Mr. Perfect by submission. March 31, 2002 – HEAT: Mr. Perfect defeated Randy Orton in a dark match. April 1, 2002 – RAW: The Hardy Boyz defeated Mr. Perfect and The Big Bossman. April 8, 2002 – RAW: The Big Show defeated Mr. Perfect. April 21, 2002 – HEAT: Mr. Perfect defeated Steven Richards. April 22, 2002 – RAW: Rob Van Dam defeated Mr. Perfect. May 2, 2002 – HEAT: Mr. Perfect defeated Tommy Dreamer. May 12, 2002 – HEAT: Matt Hardy defeated Mr. Perfect. May 8, 2002 – Mr Perfect was released from his WWE contract after an incident on the Plane Trip from Hell. Apparently, Hennig got juiced up and had an altercation with Brock Lesnar, the biggest up-and-comer in the WWF at the time. October 9, 2002 – NWA:TNA: Syxx/James/Hennig defeated Killings/Jarrett/Lawler (Hennig debuts pinning World Champion Killings). October 16, 2002 – NWA:TNA: Ron Killings pins Curt Hennig to retain the World title after Jeff Jarrett (and many others) interfer. October 23, 2002 – NWA^TNA: Ron Killings pins Curt Hennig again to retain the World title with distraction from Mr Wrestling III. October 30, 2002 – NWA^TNA: Curt Hennig is defeated by Jeff Jarrett in the #1 Contenders Tournament. November 27, 2002 – NWA^TNA: Brian Lee and Slash defeat BG James and Curt Hennig by DQ to retain. December 11, 2002 – NWA^TNA: Jeff Jarrett defeated Curt Hennig to retain the NWA World title. December 14, 2002 – Future of Wrestling: Curt Hennig b Bruno Sassi to win Future of Wrestling title. January 8, 2003 – NWA:TNA: Curt Hennig defeated David Flair. February 10, 2003: Curt Hennig suddenly passes away at the age of 44 in Tampa. ~~~Hennig was in town for a show being promoted by Jimmy Hart at the Tampa State Fairgrounds tonight. ~~~Hennig was seen alive at 9:30 a.m. by Mickey Jay in his room, but a few hours later when he failed to show up at the gym. ~~~A workout partner went back to the room and he was found passed out at about 1 p.m.
~~~Hennig was officially pronounced dead a short time later. March 25, 2003: Tampa Coroner’s office and Tampa Medical Examiner’s office reports that Hennig died of “acute cocaine intoxication”. February 19, 2007 – RAW: They announced “Mr. Perfect” Curt Hennig will be inducted into the WWE Hall of Fame 2007. March 31, 2007 – Hall of Fame: “Mr. Perfect” Curt Hennig was inducted into the WWE Hall of Fame by Wade Boggs. April 1, 2007 – WrestleMania 23: The Hennig Family (*representing* Mr. Perfect) was introduced to the audience at Fords Field. September 22, 2008 – RAW: Charlie Haas did a hilarious “tribute” to Mr. Perfect (Curt Hennig) to plug the new Mr. Perfect DVD.